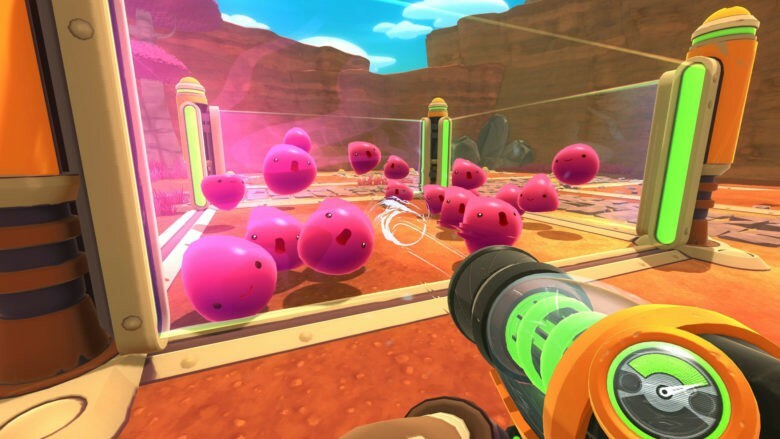 Glowing graphics and quirky fun will make Slime Rancher a new favorite. Slime Rancher, the insanely fun first-person “slimer” from Monomi, is now 50 percent bigger with more slimes and game modes than ever before. Currently on Steam’s Early Access for Mac and PC, Slime Rancher is a colorful, whimsical game that will capture your heart and game-playing time. Sounds like fun, doesn’t it? The visuals are gorgeous, with panoramic landscapes and glittering creatures to explore, learn about, and breed (which will give you even more interesting slimes to play with). The new Indigo Quarry update adds a whole new area to play in along with several new slimes, veggies, and an entirely new game mode. The Indigo Quarry itself is a winding network of caves and cliffs with a deep purple color theme. Once the site of a mining project, it’s a great place to find rare ores to power your ranch. The addition increases the total game world by about 50 percent, too, giving you plenty more space to play around in. The new slimes are pretty great, as well. Rad slimes are highly valuable but also incredibly radioactive while Lucky slimes eat coins and look like kittens. Their jingling sound is how you know they’re full of coins that you can harvest, if you’re lucky. Finally, there’s a new game mode, called 5-Day Rush, in which you’ll try to collect as much newbucks (the game’s currency) as possible over five days, with high scores to brag about at the end of the period. It’s a new thing the developer, Monomi Park, is trying out, and can be expanded and added to if the community of Early Access players respond well to it. If you’re looking for a fun game you can play on your Mac, with your kids or without them, you can’t do much better than Slime Rancher, available for Mac (or PC) on Steam Early Access for $20.